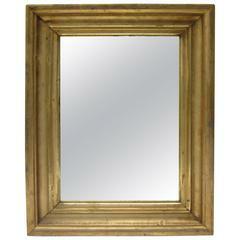 19th century original gold surface round mirror. 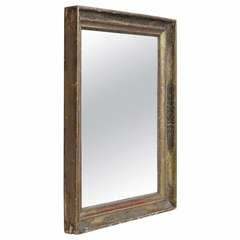 This wired mirror is in good condition and has minor wear on the edge of the base of the mirror. 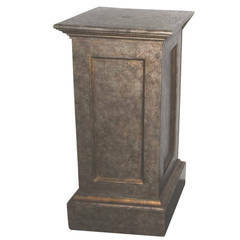 This copper urn has a amazing untouched copper patinated surface and double handles. The condition is very good. 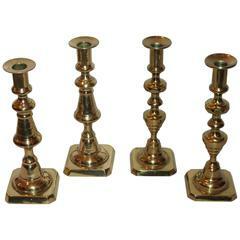 These beautiful polished brass 19th century candle stick holders were found in New England and are in fine condition. Sold as one collection. This collection of three 19th century plaid cotton linen pillows have a natural linen backing. These muted colors are red, white and blue. Nice crisp white linen backings. 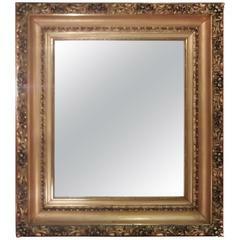 Large wall mirror with a profiled giltwood frame with cymatium molding. The mirror pane is new. Inside Dimensions: 102 x 62 cm. 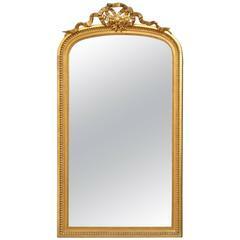 French Neoclassical style mirror with an elaborate gilt frame and original mercury mirror. 19th century Italian giltwood mirror with carved details of faces, flowers, shells and acanthus leaves throughout. Elaborate 19th century giltwood mirror. Nicely detailed and thick frame with original gilt with slight wear. 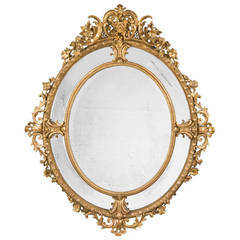 19th century giltwood mirror, American, late 19th century. 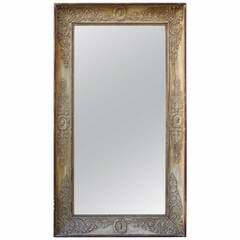 Retains wonderful original patina to the original mirrored glass and the gilt wood frame. A fine French oval 19th century giltwood mirror, with bevelled border plates and elaborate scrollwork, flowers and foliage, retaining original gilding.